American sanctions against Iran threaten havoc for the world’s finely balanced oil market, cutting spare-capacity to dangerous levels and raising the risk of a major economic shock if anything goes wrong. Analysts warn that the draconian move by Washington will halve Iran’s oil exports by November, squeezing global oil supply by up to 1.5m barrels a day (b/d). This would leave the world with safety buffers near zero for the first time in the modern oil age, assuming that global economic growth continues at trend rate. This is a thinner margin than during the two great oil shocks of 1979 and 2008. It leaves a sword of Damocles hanging over the world economy. Iraqis wait in a gas line on June 30, 2008 near a gas station amid a sand storm in Baghdad, Iraq. 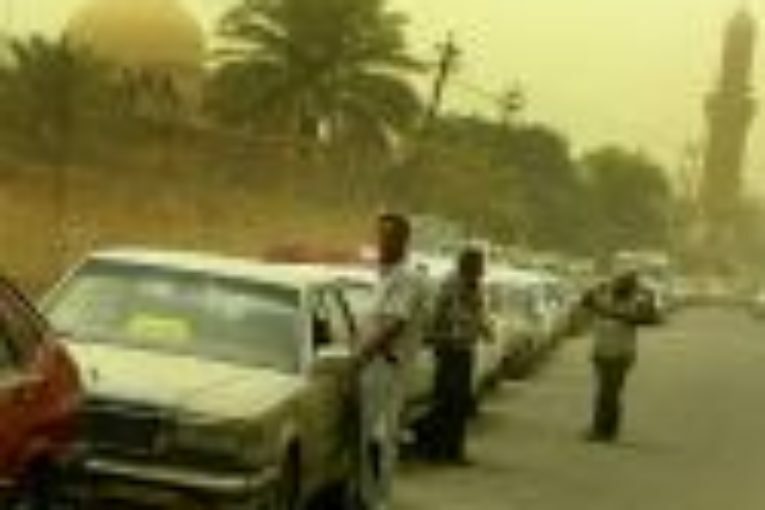 The shortage in gas led to massive queues and a flourishing black market trade of fuel in Baghdad. Westbeck Energy warned that any supply shock or a geo-political crisis in these circumstances could trigger an explosive spike to US$150 or more by the middle of next year. The clash with Iran comes at a critical moment for global oil markets. The four-year glut of global crude has been cleared and Venezuelan output is in free fall. A pipeline crunch has checked the growth of U.S. shale oil output from the Permian Basin in Texas until late 2019. Spending on upstream exploration and investment collapsed during the oil slump from 2014 to 2017. The delayed effects will kick in with a vengeance next year as output from conventional fields contracts by at least 1 million b/d. The big global oil companies have not replaced declining fields. Goldman Sachs said the world will soon be facing a “very tight oil market” that erodes OPEC’s remaining buffers. Westbeck says sanctions could cut Iran’s exports by 1.2 million to 1.5 million b/d by November when the deadline expires. “Once the elections are out of the way, we expect the U.S. to be ruthless: sanctions could affect over 2 million b/d of Iran exports by early 2019,” said Jean-Louis Le Mee, the group’s chief executive. Helima Croft, from RBC Capital Markets, said the greatest risk was what could happen if the Iranian regime retaliates, setting off a regional conflagration. This may well occur since the Trump administration is clearly trying – despite denials – to precipitate regime change by reducing the economy to its knees. The Iranians might unleash speed boat attacks on tankers in the Strait of Hormuz, the choke point for a fifth of the world’s maritime oil supplies. “Last week’s provocative military exercises in the Persian Gulf can be read as a sign that hardliners in the revolutionary guards have no near-term intention of suing for peace. Our view is that this -dangerous standoff will only deepen,” she said. Croft, a former oil analyst at the CIA, said Iran is likely to restart its nuclear facilities and set off a Mid-East arms race once it is clear that the EU cannot save the six-power “JCPOA” deal. “Even if neither side really wants a shooting war, there is an ever-growing risk of an unintended escalation,” she said. There have already been 27 missile strikes this year against Saudi targets by Iranian-backed Houthi rebels in Yemen. This poses a threat to the passage of Saudi tankers through the Bab-el-Mandeb Strait. Saudi Arabia has temporarily halted all oil shipments through a key waterway after Yemen’s Iran-aligned Huthi rebels attacked two crude vessels, officials said on July 25, 2018. Europe has vowed to resist the Trump administration’s unilateral sanctions, invoking a “blocking statute” to protect European companies from secondary fallout. It deems the blockade “illegal”, a breach of UN Security Council Resolution 2231. In reality, the EU is powerless. Washington has acquired hegemonic control over the dollarized global banking system and the nexus of financial payments. A cell at the U.S. Office of Foreign Assets Control (OFAC) has perfected the art of throttling economies and tracking down any bank, insurer, shipper, or logistics firm that colludes. It prides itself on the “boa constrictor’s lethal embrace”. President Donald Trump has raised the stakes, vowing “severe consequences” for any individual or entity that flouts US will. “Anyone doing business with Iran will not be doing business with the United States,” he tweeted yesterday. OFAC’s stealth weapon is a “scarlet letter” under Section 311 of the U.S. Patriot Act. Once a company is tainted with alleged money-laundering or underwriting terrorist activities – elastically defined – it becomes radioactive. The South China Morning Post reports that China’s trade council has enlisted experts to help firms to navigate the pitfalls of trading with Iran. It advised them to avoid clear breaches of US law, deeming it too dangerous whatever the rights and wrongs of the issue. “No one dares lose the U.S. market,” said one Beijing official. Japan and South Korea are effectively going along with their U.S. ally. Indian refiners are cutting reliance on Iranian crude whatever New Delhi says or does. There will be leakage but it has become clear that at least half of Iran’s 2.8 million b/d exports will be shut in. For now, the world oil market is well supplied. U.S. crude has settled at just under US$70, held down by weaker growth in China and Europe, and by the stifling effect of trade wars. That may prove false comfort. What is missing is the OPEC reserve buffer to cushion shocks. In theory Saudi Arabia could boost output by 2 million b/d. Few believe it. S&P Global says Saudi Aramco is already running flat out. “They could potentially add another million, but how much further and faster has never been tested. There has been speculation that they can’t produce more,” said Ole Hansen from Saxo Bank. If the Trump administration succeeds in removing 2 million b/d of Iranian crude from the world market by early 2019, it may not like the economic consequences.